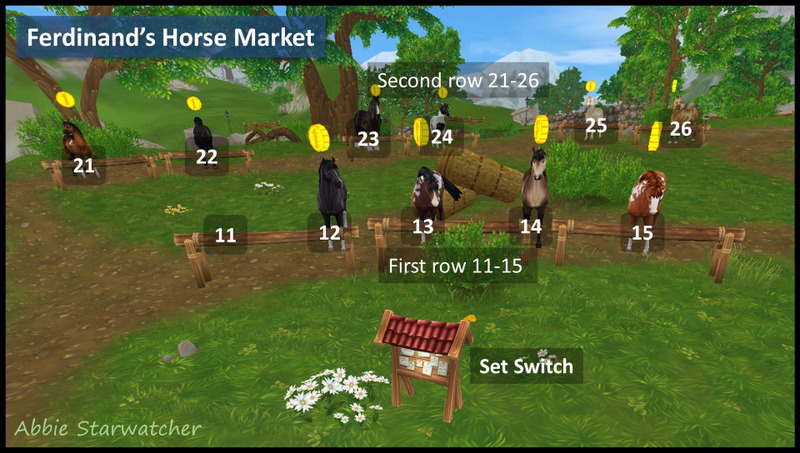 This table presents all available horses (breeds) that you may buy, besides your horse you started with. Unfortunately, SSO is frequently changing the points of sale for the horses. Therefore I can't guarantee that the indicated sites will always be up-to-date. Enjoy yourself browsing and selecting your horses. Abbie Starwatcher. Starter Horses: Here you can see a list of all starter horses ("Jorvik Warmblood"). At the horse market there are 4 sets of horses that are placed on 21 positions. Look on this position plan to find the numbered positions indicated in the table. Use the dropdown selectors below to filter the table in relation to point of sale and/or horse breed, in order to display only corresponding items. The colour checkboxes may be used to look for horses with the corresponding coat colour. In addition you may click on a column header to have the column sorted (use CTRL to select multiple columns).